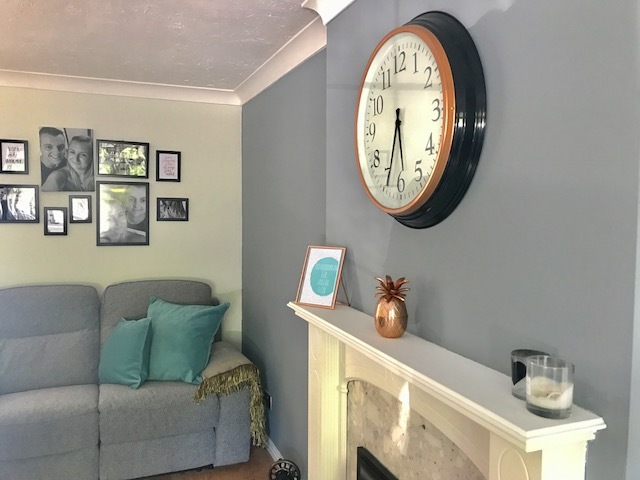 I have been putting this little series together of showing the different rooms within my new house so if your new here check out my Bathroom and my Kitchen and if your keeping up with the series, here is my living room! This one has been a long time coming as we had to wait a few months for our sofas however, it is finally complete! 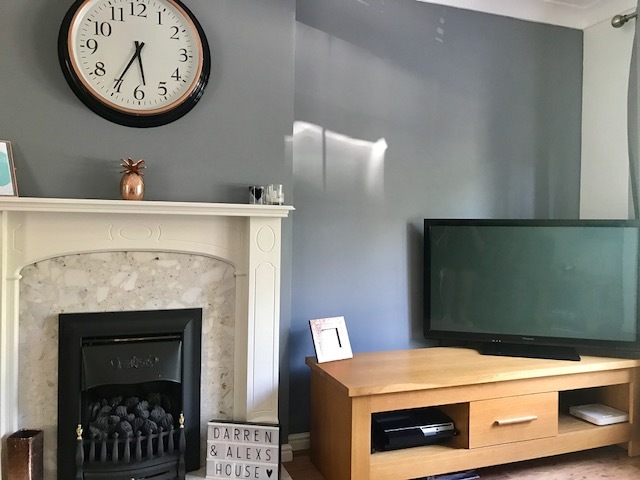 We decided to paint one of the walls a Grey colour and the others white. The window frame is brown and there isn't a lot of natural light that comes in to the room so we do want to change the window at some point to make it brighter but for now the white walls help! 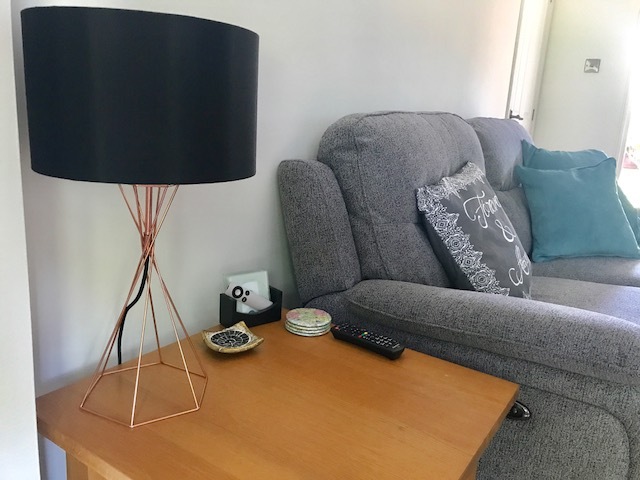 We choose to have copper accessories this included this copper wire light shade from Ikea complete with this funky edison bulb from Ormrod* it doesn't give off a lot of light but we love the way it looks. 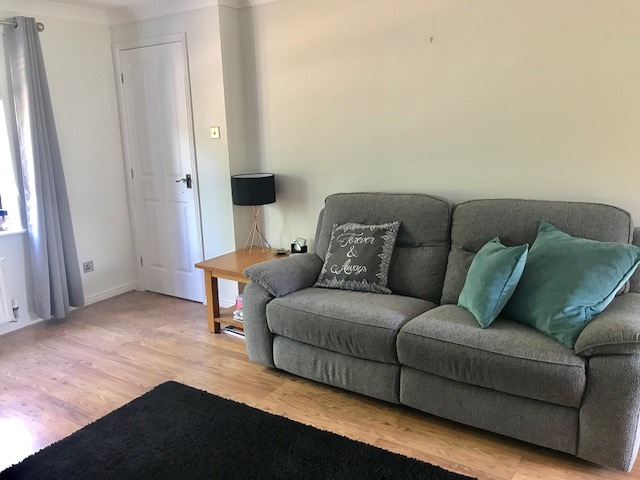 We current have wooden floors however, we would like to change this for carpet just as we think its cosier for a living room. For now we have a rug which was my parents and we inherited it (like a lot of our things) as they replaced it with a new one. It is nightmare as we are always hoovering it but its all good for now. (Spot the Frenchie haha). 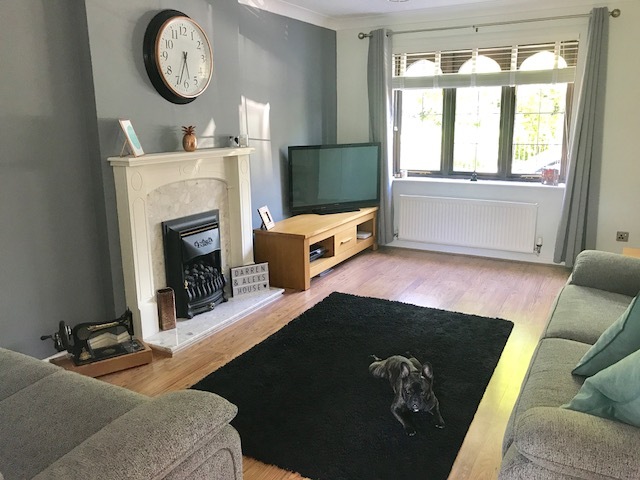 The TV unit and coffee table again where inherited from my parents, they fit perfectly so where ideal for what we needed, but again we would like to change them when we can. Another inheritance is our clock! Again my parents replaced theres so we snapped this one up! Originally it had a silver trim on it but we took this off and sprayed it copper and it really completes the room. We have had loads of complements on it so I'm pleased we did. One thing that I love is our lamp. 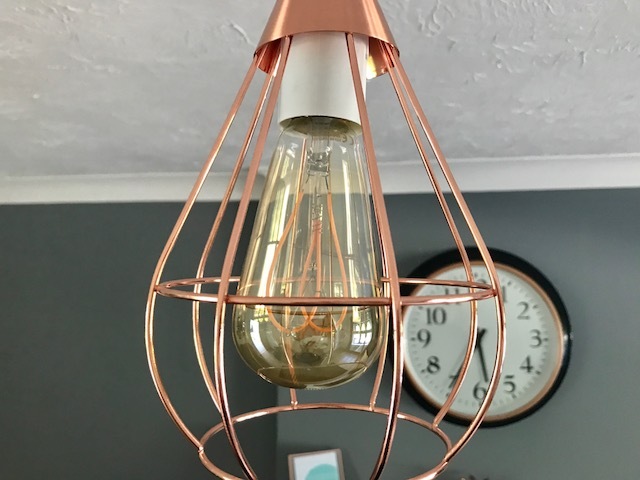 We picked this up for less than £20 in Home Sense a few months ago, I have seen a few various styles in there since too. 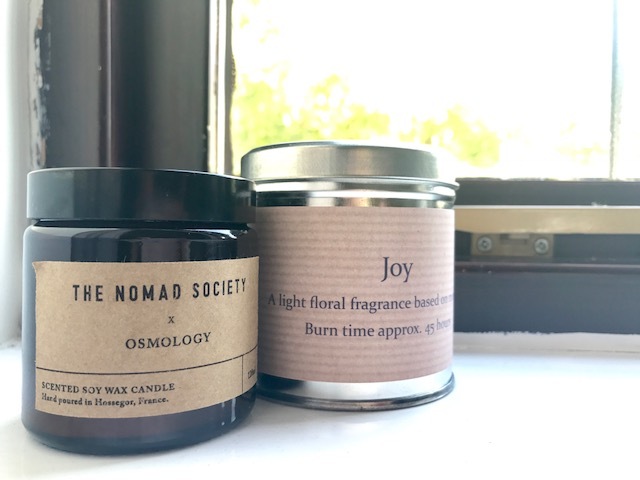 I have some beautiful smelling candles on the go at the moment one that a friend bought me as a moving in gift and the other from Osmology by the Nomad society*. 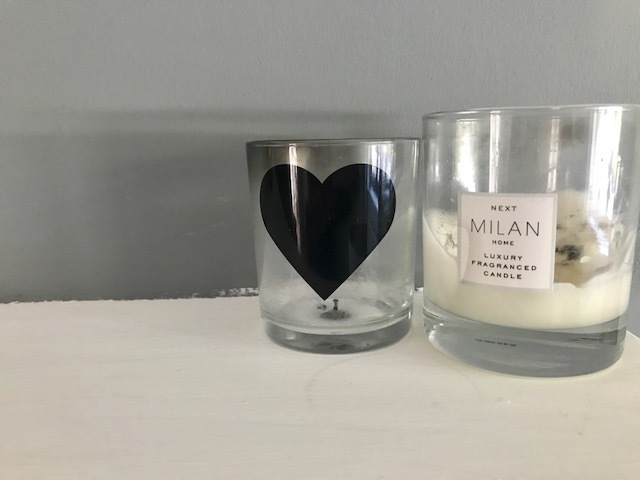 I love the look of this candle as it suit our room really well and smells amazing. It is only a small candle so doesn't last ages but I do love it. 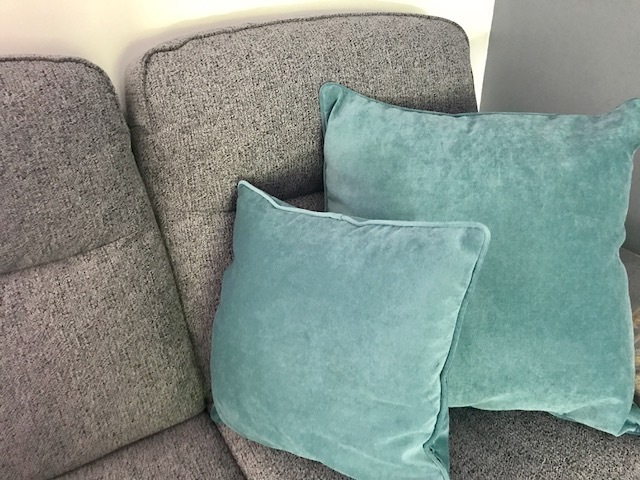 Once our sofa finally arrived we decided to spend the last our our Next gift vouchers we had received and bought these teal coloured cushions. They help brighten up the room by adding a bit of colour in, plus they are very comfy! 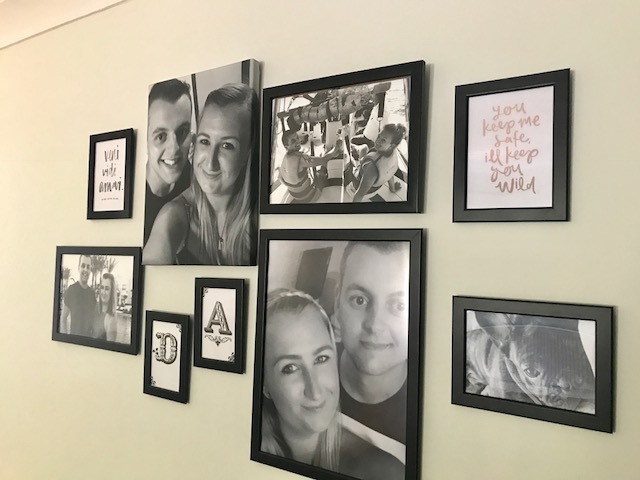 The photo wall is probably my proudest achievement within the house as I did it all on my own! 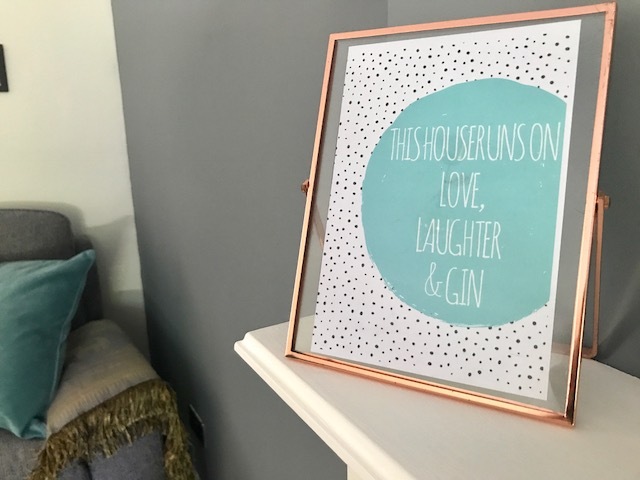 I measured it all out traced the frames with grease proof paper then used washi tape to place it out on the wall then hammered nails where I needed and that was that. 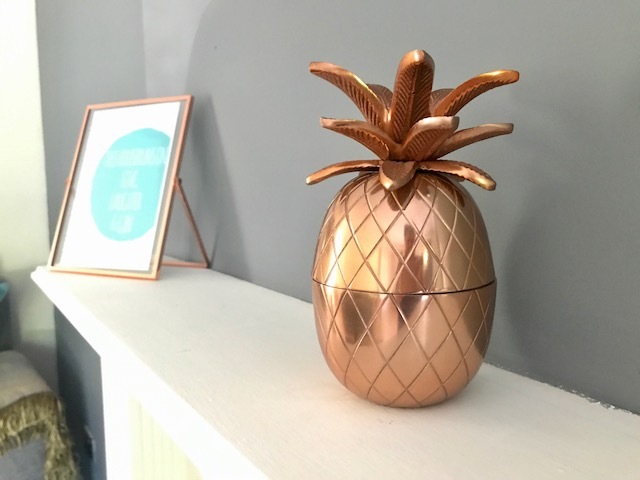 I love it, I think it looks so good :D. My copper pineapple was a gift from Darren as I nagged for one for ages haha. I loveee it as it makes a fruity addition to the room. 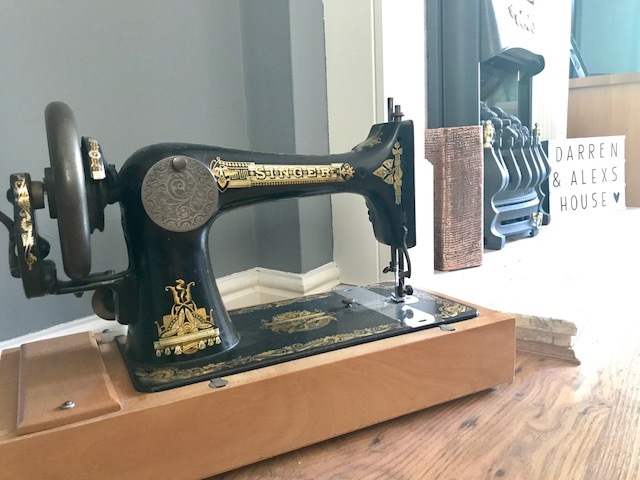 I hope you liked another of my room tours and maybe have some inspiration for your own home! *Some items have been sent for review purposes. Super cute! Love the grey. Can't wait to have my own place.